Here's something completely different. 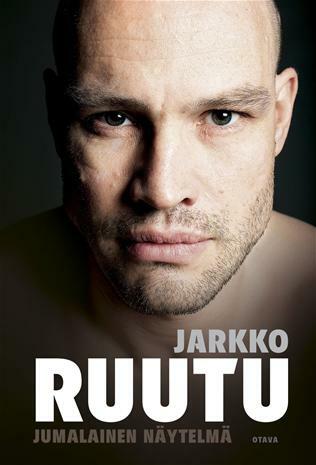 The autobiography of a notorious Finnish ice hockey player, who recently quit the money leagues. Jarkko Ruutu played in the NHL for the Vancouver Canucks and the Pittsburgh Penguins, among others, and had a spotty career, where he was constantly being sent down to the AHL and then being called back up to the NHL. He played a mean game and was constantly in the news for his fighting, heckling and provocations toward other players. He would do everything he could so that his team could get the other hand in a game. What makes this book interesting is the way that it portrays a completely different kind of professional sports career. Ruutu isn't loved by everyone. Actually he was once voted the most hated player in the league. His antics put him on the front pages of newspapers, but rarely in a good light. He cherishes his profession but also cries in frustration after games because as his career doesn't always go as planned. Before each season he would make a bet with a friend on the number of penalties that he would get during the season. Ruutu always underestimated his capacity for giving in to his animal instincts. And so every year he would lose that bet. His guesses were never even close. I was surprised by how poorly his teams were managed (if you take Ruutu's comments at face value). Managers and coaches, both in the NHL and in Finland, treat players as property or assets and give very little attention to actually leading them. The business world has already understood that treating your employees as humans greatly increases output. So why is this so difficult to believe in a sports setting? I imagine that the effect would be even bigger in professional sports, where star athletes put themselves under immense pressure to perform. A prominent Finnish coach gets an especially bad rap. I could only wonder how on earth he could be one of the top dogs with such poor personal skills. His method mostly involved insulting, yelling and playing players against each other. So grab this for the entertainment value and occasional insight, but don't hesitate to skip passages or chapters entirely. Comments from Ruutu's team mates and coaches add little, and Ruutu's own diary entries mostly show the repetitive and banal side of the sport. Surprisingly, a good companion to this book is YouTube. Television cameras were present for a lot of what is described, and reading about ice hockey only takes you half the way.